The good: Let’s start with former third-round pick Kenny Golladay, who in his second season, eclipsed the 1,000-yard receiving mark (1,063) on 70 catches. He’s starting to understand coverages, what defenses try to do to take him away, and how he can counteract that. That’s only going to continue to develop the more experience he gets and film he watches. Golladay and veteran Marvin Jones Jr. have emerged as two of the best contested ball receivers. Golladay (6-4, 220) has a big frame and strong hands. He comes down with the 50-50 balls more than he doesn't. Jones isn’t as big (6-2, 198), but he has terrific speed and body control, and is terrific at high pointing the ball. Those are two big targets both under contract next season. Both averaged better than 14.0 yards per reception (Golladay, 15.2; Jones 14.5). Veteran Bruce Ellington was signed by the Lions midseason to try and fill the void left in the slot by the trade of Golden Tate. He caught 23 passes in four games played with the Lions, and showed he can be a reliable pass catcher. The bad: Following the Tate trade, the Lions struggled to make plays after the catch. Tate has been among the league leaders in that category since he entered the NFL, and the Lions missed that aspect of his game in their offense. Detroit averaged nearly 30 more yards gained after the catch per game with Tate than they did without him. The 13 touchdown passes Matthew Stafford threw this season to his receivers are the fewest in a season in which he’s played all 16 games. By comparison, he threw 25 touchdowns to receivers in 2011 and 18 last season. Detroit has a need this offseason to add another playmaker to this group, probably one with speed, who can separate from defenders and make plays after the catch. Key stat(s): Stafford’s 6.8 average yards per attempt was his lowest since 2012. He completed 44 passes of 20-plus yards (ranked 17th) and six of 40-plus yards (20th). Those numbers were down significantly from last year, when Stafford ranked third in the NFL with 61 completions of 20-plus yards and was No. 1 with 16 completions of 40-plus yards. View photos of the Detroit Lions' 2018 wide receivers. Detroit Lions wide receiver Kenny Golladay (19) during a NFL football game against the Buffalo Bills on Sunday, Dec. 16, 2018 in Orchard Park, N.Y. (Detroit Lions via AP). Detroit Lions wide receiver Kenny Golladay (19) during a NFL football game against the Carolina Panthers on Sunday, Nov. 18, 2018 in Detroit. (Detroit Lions via AP). Detroit Lions wide receiver Kenny Golladay (19) during a NFL football game against the Green Bay Packers on Sunday, Oct. 7, 2018 in Detroit. (Detroit Lions via AP). Detroit Lions wide receiver Marvin Jones Jr. (11) during a NFL football game against the Minnesota Vikings on Sunday, Nov. 4, 2018 in Minneapolis. (Detroit Lions via AP). Detroit Lions wide receiver Marvin Jones Jr. (11) during a NFL football game against the New England Patriots on Sunday, Sept. 23, 2018 in Detroit. (Detroit Lions via AP). Detroit Lions wide receiver TJ Jones (13) celebrates a first down during a NFL football game against the Green Bay Packers on Sunday, Dec. 30, 2018 in Green Bay, Wisc. (Detroit Lions via AP). Detroit Lions wide receiver TJ Jones (13) during a NFL football game against the Los Angeles Rams on Sunday, Dec. 2, 2018 in Detroit. (Detroit Lions via AP). Detroit Lions wide receiver Bruce Ellington (12) during a NFL football game against the Arizona Cardinals on Sunday, Dec. 9, 2018 in Glendale, Ariz. (Detroit Lions via AP). Detroit Lions wide receiver Bruce Ellington (12) during a NFL football game against the Los Angeles Rams on Sunday, Dec. 2, 2018 in Detroit. (Detroit Lions via AP). Detroit Lions wide receiver Brandon Powell (10) before a NFL football game against the Seattle Seahawks on Sunday, Oct. 28, 2018 in Detroit. (Detroit Lions via AP). Detroit Lions wide receiver Andy Jones (17) during a NFL football game against the Green Bay Packers on Sunday, Dec. 30, 2018 in Green Bay, Wisc. (Detroit Lions via AP). Detroit Lions wide receiver Andy Jones (17) during a NFL football game against the Arizona Cardinals on Sunday, Dec. 9, 2018 in Glendale, Ariz. (Detroit Lions via AP). Free agents: Veteran TJ Jones finished the season on a good note with two touchdown grabs in Green Bay in the finale, but his season was a little disappointing after re-signing as a restricted free agent. He caught 19 passes for 190 yards with more opportunity to play this season, after catching 30 passes for 399 yards in 2017. He’s an unrestricted free agent this offseason. Ellington is also an unrestricted free agent. His play in the month he was on the field before suffering a hamstring injury late could earn him another look by the Lions. Draft: This isn’t a receiver class that jumps out with top-tier talent, but it’s a pretty deep class as it stands right now. A.J. Brown of Ole Miss and N’Keal Harry of Arizona State are bigger-bodied receivers currently considered by most analysts to be first-round caliber prospects. 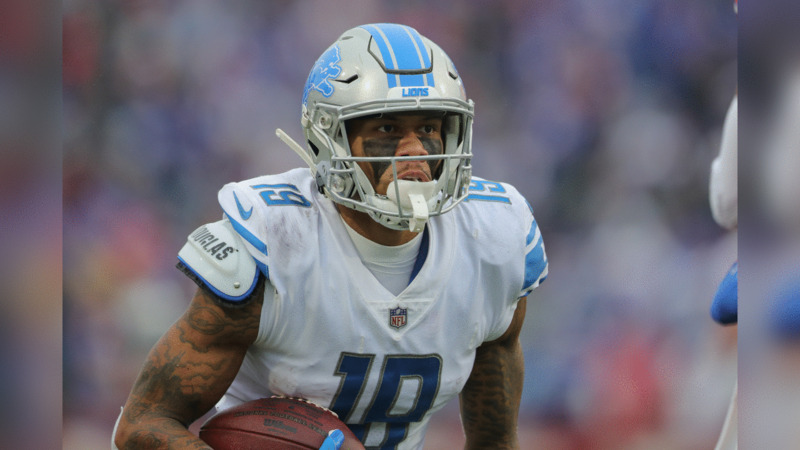 With Golladay and Marvin Jones under contract next season, the Lions could be on the lookout for a speedy, playmaking slot-type receiver. Marquise Brown of Oklahoma and Parris Campbell of Ohio State fit that mold as 4.3 speedsters with a lot of production. MVP: Golladay is the clear choice here. When Marvin Jones went down with a knee injury against Chicago Week 10, Golladay stepped up and showed he has the potential to be a No. 1 option in just his second season. Most improved: We can plug Golladay in here, too. He showed flashes his rookie season, but really emerged in year two as a consistent threat teams have to scheme for. His route running improved tremendously from year one to two, and so did his understanding of opposing schemes and coverages. The Lions are certainly hoping Golladay continues on the upward trajectory we’ve seen from him over the course of his first two seasons.